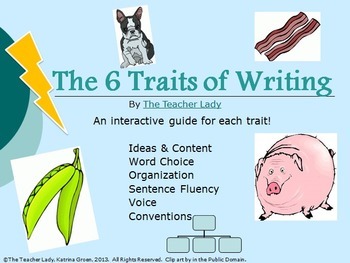 This PowerPoint Presentation teaches students about the 6 Traits of Writing by breaking down the meaning of each trait, using helpful acronyms and pictures. 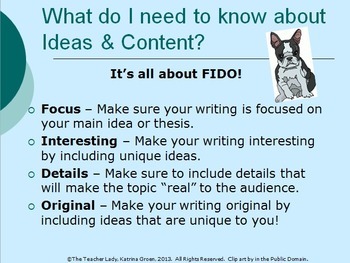 For example, writing that displays good Ideas & Content is usually FIDO - Focused, Interesting, Detailed, and Original. 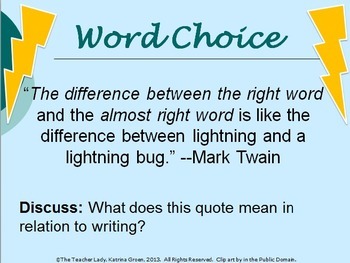 There are several slides for each trait, containing a quote or picture relating to the trait, a detailed explanation of the trait, example passages, and a chance to revise for the trait. If you're planning on having your students take notes on the PowerPoint, you may want to download my 6 Traits of Writing Presentation Cloze Notes, which are specifically designed to complement this presentation. See the link below! 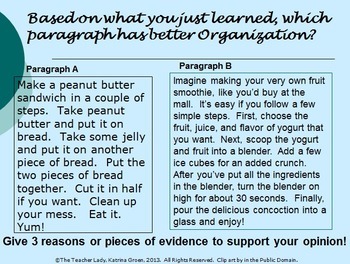 You might also be interested in my other 6 Traits of Writing Products!